Shio introduced himself as a ninja Squirtle, while Lumi introduced himself as a quiet book reader. Shio acted hyper, and randomly hugged everyone which made things akward. He was hyper for the most part, until Little Squirt began explaining the HQ and the squad itself. That is when he fell asleep more than a few times and was woken up every time by a smack from Lumi. Shio started to get impatient, almost running into the HQ while Little Squirt was still talking. Finally, they all went into the headquarters and Shio ordered a double cheeseburger at the counter of the kitchen. Within an instant, the fine chefs of the Squirtle Squad Elite HQ handed him a tasty double cheeseburger, which Shio quickly gulped down. Lumi, being the bookworm that he is, was anxious to see the library, but never got a chance to. Little Squirt asked them if they would rather have their first mission now, or after they explored the HQ more. Both Lumi and Shio voted on doing the mission that instant, but Shio had a sudden urge to take a nap. Reluctantly, they decided to get some rest and then do the mission. Out of no where, Lumi jumped on Shio while he was sleeping, but suprisingly didn't wake him up. While they were "sleeping", Little Squirt decided to try and get some work done. He plopped down on the computer, but a weird icon flashed on the screen that he was far too familiar with. His computer had been hacked. But, it was no normal hacking... It only took a few minutes for Lumi to wake up and ask about Little Squirt's computer troubles, with Shio closely following. Before Little Squirt had time to explain how it would be impossible to try hacking their computer system back, Shio tryed it anyway. It obviously didn't work and it was back where it started (hacked). Lumi and Shio eventually got into a fight again, with Little Squirt splitting them up. Out of no where, Shio ran out of the door of the HQ and stole a cab, kicking out the driver. He drove away for a second, then came back to settle things with Lumi. But, Little Squirt managed to get on the car, bash the windshield open, and threw Shio out of the car (knocking him out). Lumi signed out. Little Squirt rushed Shio to the medical facility in the HQ, scorning him for running away, let alone committing a crime. 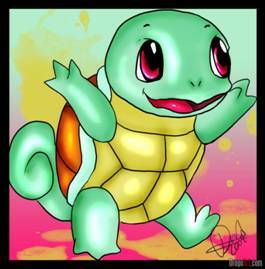 Little Squirt expected much more from Shio from then on out, if he planned to be a member of the Squirtle Squad Elite. Shio went to sleep, with Little Squirt waking him up only second later; explaining that if he had time to hijack a taxi, he had time to do some work for the squad. He explained that the weird icon on his computer screen was really an evil corporation called the Gigas that had hacked their database. Little Squirt assigned him the mission of defeating three low-level Gigas. He said he would drive him to their base, but that was as far as he would go as far as helping him. Who would have thought that mission would never be accomplished. Little Squirt unlocked the car doors of the Squirtle Squad Elite's own car, and began to speed down to the Giga's base (which was only a few minutes away from there, which was why there was so much alarms and cameras around the HQ) with Shio. When they arrived at the Giga base, Little Squirt realized too late that something was different. He turned around quickly and started to speed back to the HQ. About half way there, he figured out that he wouldn't be able to lose them. He stopped abruptly in the middle of the one lane road. Good thing there weren't many people living around this area. Little Squirt told Shio to stay in the back seat until told to come out, and he followed orders. Little Squirt looked around at the woods on both sides of the road, sensing them. Both Shio and Little Squirt could hear laughing now- a lot like that of a hyena's. Little Squirt was planning a strategy when Shio used his telekenetic abilities to make the weird-looking Giga fall out of a bush. The Giga swung at him and missed, while Little Squirt grabbed him by the throat. Little Squirt looked directly at the Giga's face and took off his spiked glasses. Lazer beams shot directly out of his eyes, knocking the Giga's head off. Shio threw up in the car, as a result of watching all of the gore. When Little Squirt looked to see if Shio was alright, another Giga leaped out from under the bushes. Little Squirt spun around just in time to punch the Giga across the face. That took care of him. Little Squirt looked around to see if there were anymore Gigas. He heard a THUD! THUD! THUD! He knew that sound, it was the sound of a gloamglozer walking. He told Shio to drive away and get backup, because Little Squirt didn't think even he stood a chance against the nine-feet tall, colossal-looking gloamglozer that stood before him. Shio drove away into the city and Little Squirt jumped onto the gloamglozer's shoulder. He strapped onto his back and tried taking off his glasses and using his lazer-eyes. Turns out he wasted all of his energy on that last attack. Turns out Little Squirt over-estimated the gloamglozer's strength after all, and it just took a stab of his glasses in his back to defeat him. After all of that happened, Shio came back with backup right when he never needed it. 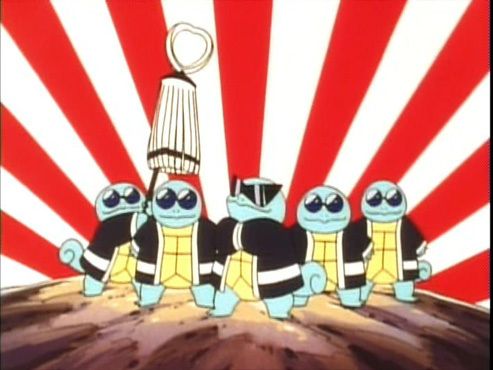 Somehow, he fit fifty Squirtles in his car and brought them here. Wonder where he got them from. Shio signed out. Little Squirt signed out. - Everyone orders their usual breakfeast from the kitchen. -Little Squirt gathers everyone in the board room. -Little Squirt begins to explain the mission for that day, but Shio gets impatient. - Another fight between Lumi and Shio forms from that again. - Lumi fights for patience, while Shio fights for impatience. -Everyone calms down, and Little Squirt explains the mission: infiltrate the Giga base and retrieve the information stolen from the computer's database. - Shio is hesitant to go with Lumi on the mission. - Lumi offers a truce, and shakes Shio's hand. - Shio reluctantly agrees to go, and Little Squirt entrusts the car keys with Lumi. - They drive off, Shio giving Lumi directions along the way. - They arrive at the base, but something doesn't feel right. No one seemed to be around. - Shio and Lumi quickly go inside, and Shio spots a small sign that reads "Computer Room". - Before they have time to go in the room, a Giga jumps out of no where and lunges at Shio. - Shio evades it and they both strike each other at once. - Eventually, once Shio distracts it, Lumi hits him right in the back. - Lumi is able to get all of the data on a disc afterwards, and comes back out where the Giga is. - The Giga falls to the ground, twitches a bit, and Shio stabs it a few times with his katana. - As the Giga slowly dies, a little boy rides up on his bike, points at it, and asks what it is. - All most as soon as he asks that, Shio tackles the boy and pins him to the ground, asking what he is doing. - Lumi gets Shio to back up from the boy, and as soon as they turn their backs; the boy transforms into a huge beast and snatches the disc from Lumi. - Shio and Lumi retreat to their car, and the beast starts chasing them. - But, as they look back; the beast is calmed down by a man in a pin-striped suit. - Little Squirt calls them on their way back, asking what happened. - They report that they couldn't retrieve the information, and encountered a beast and a man who calmed it down. - Little Squirt is in shock for a moment, hearing about the man and beast, never expecting them to be there. - They come back, and Little Squirt awards them for their bravery with a "partner" or vicious pet. - He explains that they are to never be let out of their cage unless in extreme dange or instructed to, because they could be just as much your enemy as they are your ally. Treat them well, and eventually they will open their hearts to you. - There was one cat-like partner and one dog-like partner, the dog being the harder of the two to train. - Shio gets to pick first, but insists Lumi goes first. - Lumi takes off the wrapping of a random cage, unveiling the dog beast. - They take their partners in their cages back to their rooms and go to sleep. - The next day, Little Squirt tells Shio it is a day off, stating that he can do whatever he wants; even go out on the town. - They eventually decide on having a pool party, and invite all of the hottest, coolest, and cutest water-type Pokemon around to join. - Halfway through, a police officer arrives at the door saying that they recently found a gremlin-like creature near their office asking for a Squirtle named Shio. - Shio walks up and the officer holds up a cage with the creature in it. - The creature mutters something about Shio hurting his sister, and Shio describes his past life as a leader of a small evil group. - His brother Mizu and him had been enemies ever since the day they were born, and one day his evil group killed his brother and friend (who must have been the creature's sister) without him wanting them to. - Shio said all of this in front of a cop, and was immediately arrested. What to do now?